That’s how one recipient of the UL Lafayette Foundation’s 2007 Distinguished Professor Award was described in a letter of nomination. It’s a description that fits all who were ultimately chosen for that honor, as well as the Foundation’s Excellence in Teaching Award. Recipients of the prestigious 2007 Distinguished Professor Award are: Dr. Azmy Ackleh, professor of mathematics; Dr. Paul Leberg, professor of environmental biology; and Dr. Jerry McGuire, professor of English. Dr. John Tanner, professor of business systems, analysis and technology, earned the 2007 Excellence in Teaching Award. A prior Distinguished Professor Award recipient, he is one of only a few faculty members who have been given both honors. The awards will be presented at a banquet in early May at River Oaks. Each professor will receive a stipend and their names will be inscribed on plaques that are permanently displayed in Edith Garland Dupré Library. 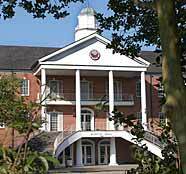 The UL Lafayette Foundation has presented the Distinguished Professor Award since 1965 and the Excellence in Teaching Award since 1992. When Dr. Azmy Ackleh was a student at University of the Cumberlands in Williamsburg, Ky., he did not intend to ultimately earn a doctorate and specialize in mathematical biology. The native of Nazareth, Israel, just wanted to obtain a bachelor’s degree in computer science and then get a job. But one day, Ackleh visited one of his three brothers, who was attending the University of Tennessee. While on campus there, he stopped by the Math Department. His life took a different direction when a faculty member urged him to consider attending graduate school. “ With my brother’s encouragement, I decided I would take a shot at a master’s degree,” Ackleh recalled in a recent interview. Later, while in graduate school at the University of Tennessee, he became interested in mathematical biology, an interdisciplinary field of study. Today, Ackleh is a respected professor of applied mathematics at UL Lafayette who has attracted almost $2 million in research funding from agencies such as the National Science Foundation and National Institutes of Health. He is especially interested in using mathematical modeling to predict population trends. For instance, he and Dr. Jacoby Carter, an ecologist at the USGS National Wetlands Research Center, developed a computer model in 2003 that enabled them to predict nutria population dynamics and movement patterns in a certain region. Ackleh and some colleagues are now working on a project that uses mathematical modeling to test policies related to alcohol consumption by college students. Suppose, for example, a city council is considering a proposed ordinance that would prohibit new businesses from selling alcohol within a mile of a university campus. Would that affect college students’ drinking patterns? Using mathematical modeling, the researchers can determine whether it would, and if so, to what degree. Their efforts could someday be used to help curb nationwide binge drinking by college students. Dr. Roger Waggoner, head of UL Lafayette’s Mathematics Department, said Ackleh encourages interdisciplinary collaboration at the university and also concentrates on helping students. Ackleh’s NSF-funded project to establish a mathematical-biology option for undergraduates is already proving to be a valuable recruiting tool. Students “find him to be demanding but charismatic, approachable and helpful,” Waggoner observed. Student evaluations of Ackleh’s teaching are “routinely among the best in the university,” he added. Ackleh is quick to give credit to others for their roles in his success. “Every single step of my life, I’ve met some good people who just pushed me forward,” he said. The math professor singles out his wife, Howwayda, for her support over the years. It’s clear that he enjoys his work. He discusses it eagerly and becomes animated as he translates complicated mathematical theories into language that is easily understood. Ackleh acknowledges that he makes a concerted effort to maintain a balance in his work, by making sure he devotes time and energy to assisting students, conducting research, teaching and service to the university. At UL Lafayette’s Center for Ecology and Environmental Technology, Dr. Paul Leberg is studying how freshwater fish adapt to the introduction of salt into their environment. It’s a particularly relevant research project because of a rising sea level and increasing saltwater intrusion into south Louisiana marshes. Leberg, a biology professor and chairman of the Biology Department’s Graduate Studies program, is confident the fish can adjust. “The great concern with the types of changes we’re experiencing right now isn’t that organisms can’t adapt. It’s that they may not be able to adapt fast enough,” he explained. Leberg studies how organisms interact with their environments. He specializes in how they survive and function after humans alter their surroundings. His expertise prompted U.S. Army officials to contact him about two endangered bird species that inhabit land it owns in central Texas. “These endangered species potentially could conflict with Army land uses. We’re trying to understand how the Army’s activities may affect the birds so we can help the Army avoid conflicts,” he said. Closer to home, Leberg recently started working with the Louisiana Wildlife and Fisheries Department to restore some of the pelican populations that were lost when Hurricane Katrina struck the state in 2005. “We’re trying to establish populations in places that don’t now occur, so if a hurricane strikes the same area in the future, we won’t lose the remaining populations,” he said. In a letter nominating Leberg for the UL Lafayette Foundation’s 2007 Distinguished Professor Award, Dr. Darryl Felder, head of UL Lafayette’s Biology Department, said Leberg is well-rounded. He’s a strong teacher and mentor, visible leader in his professional field and an “accomplished solicitor and manager of grant funding,” according to Felder. Since joining the UL Lafayette Biology Department in 1992, Leberg has obtained more than $2 million in research grants. Funding sources include the prestigious National Science Foundation, the U.S. Department of Defense, U.S. Geological Survey and U.S. Department of Energy. Leberg holds the Fritz Lang Board of Regents Support Fund Professorship in Environmental Biology. Dr. Jerry McGuire’s passion for the creative world is evident whether he is working on a poem or teaching a writing course to students. The proof is in his success as a published poet, editor and teacher. His art and his profession are priorities in his life. “It’s all about taking care of the world around you. I know in a room of 20 students, I’m not going to turn out 20 Emily Dickinsons or Robert Frosts. But, I can help students connect with the talent that is in them,” said McGuire, professor of English and head of the Creative Writing Department. One of his first assignments to students is to analyze messages in Chinese fortune cookies. He has a collection of 60-70 fortunes, some with messages he considers to be good fortunes and some he considers to be bad. Some messages, he writes himself. He asks his students to decide which are good and bad, and then explain their conclusions. “The point is to decide what makes it a good fortune or a dull one. And, it’s all in the language,” he said. McGuire should know. He has published two books of poetry and his work has been included in 11 anthologies, including Best American Poems of 1992 and Another South. McGuire has given more than 45 scholarly presentations and has been a Fulbright lecturer. Not much can keep Dr. John Tanner from his classroom – not even injuries sustained when he was robbed at knifepoint in his university office seven years ago. “ I always preach to my students that they have to come to class no matter what. I couldn’t not come to class the next day,” he said recently. Tanner is a professor of business systems, analysis and technology in the B.I. Moody III College of Business Administration. His attacker was given concurrent prison sentences of 20 years for aggravated battery and 45 years for attempted armed robbery. Tanner’s devotion to his students, which was illustrated by his determination to recover from the attack quickly and his attendance philosophy, is one reason he was chosen to received the 2007 Excellence in Teaching Award. He’s also a great teacher, according to some of his students. “ Dr. Tanner was possibly the best teacher that I have ever had. That includes elementary school, high school and college. I could tell that he really cares about his students and how they are progressing in the course,” wrote one student. Those words are music to Tanner’s ears. His first priority in the classroom is making the material clear to his students. He uses humor, and even lyrics to rap music if necessary, to get his point across. “ Many people don’t like math. They don’t have a feel for it. I try to make it understandable. So then they’re not so scared and they realize that it’s not as bad as they thought,” he said. Tanner first worked in the oil industry as an accountant and auditor. He turned to teaching when he felt he didn’t have control of his time. “ Granted, teaching doesn’t reduce your workload, but I have more control over what I’m doing,” he said. He hasn’t looked back since. In fact, he’s only looked forward, according to his peers. Tanner is one of only a few faculty members who have been honored by the Foundation with its Distinguished Professor Award and its Excellence in Teaching Award. He has also received the Outstanding Teacher Award in his college twice and was nominated for the Council for Advancement and Support of Education’s National Professor of the Year Award last year. He has written numerous chapters and reports for referred journals and publications and he’s made presentations to many business groups across the globe. But, it’s not his research that he wants students and peers to remember about him. “I really think of myself as a teacher. And, I want to be remembered as a teacher,” he said.